We set off in our agreed order and right away looked behind and saw Ed slow out of the blocks and the 3 of us had to soft pedal while he caught us back up. Turns out he was having problems with one of his cleats clipping in. The conditions were good on the course with little wind and settled in to our formation and it felt like we were relatively smooth compared to our practice efforts. After the roundabout heading back Ed began to struggle and in the latter stages we were 3up for the last part and Colin was on the limit and no longer able to take turns. Damien and I pushed on alternating turns to the finish in a time of 17:13 for the 3 of us. Ed came in about 20 seconds back but still set a PB. This left us 10th overall so at least a point for our efforts and 38 seconds off the lead going in to the afternoon stage. 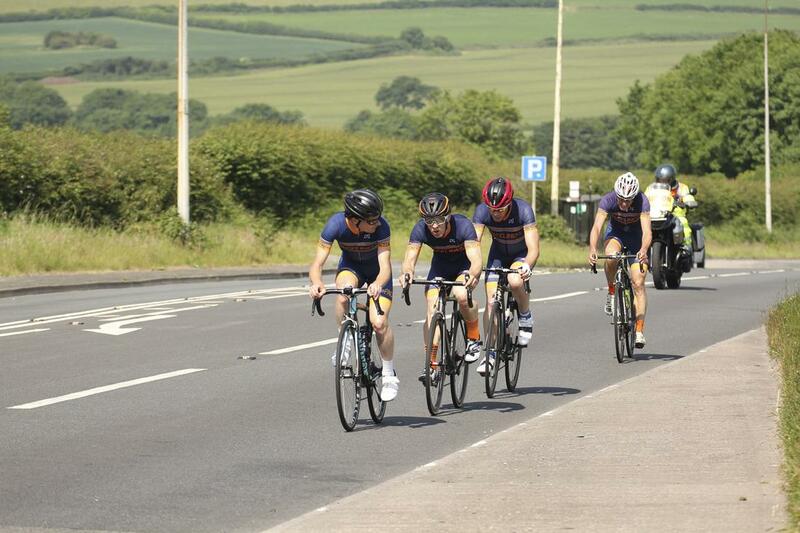 It was pretty hot by the afternoon and we rolled out from HQ to start the 55 mile stage which was 2 laps of the course before finishing on the dual carriageway. The first half lap or so was pretty steady and a few attacks were tried but shut down. The bunch was staying together and it was quite sketchy in places with parked cars and traffic and a few riders not taking much care. After the coastal section a couple of riders clipped off the front and managed to get a gap which I bridged across too. 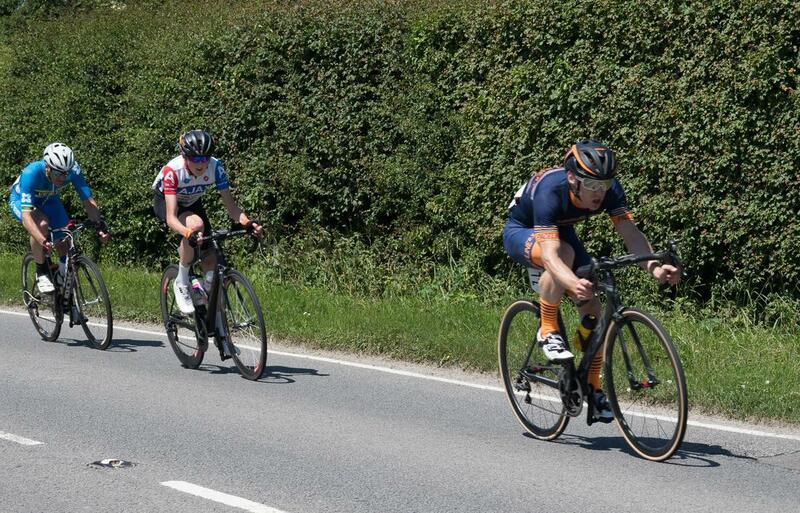 I came straight through and it quickly became apparent that the Sussex guy wasn’t able to work and it was just me and one of welsh junior riders doing the work. After about 10 minutes we sat up and were caught by the bunch. In any case the legs had felt good even if it came to nothing. The pace on the second lap was faster and again a few attacks were tried and eventually a group of 5 went up the road. 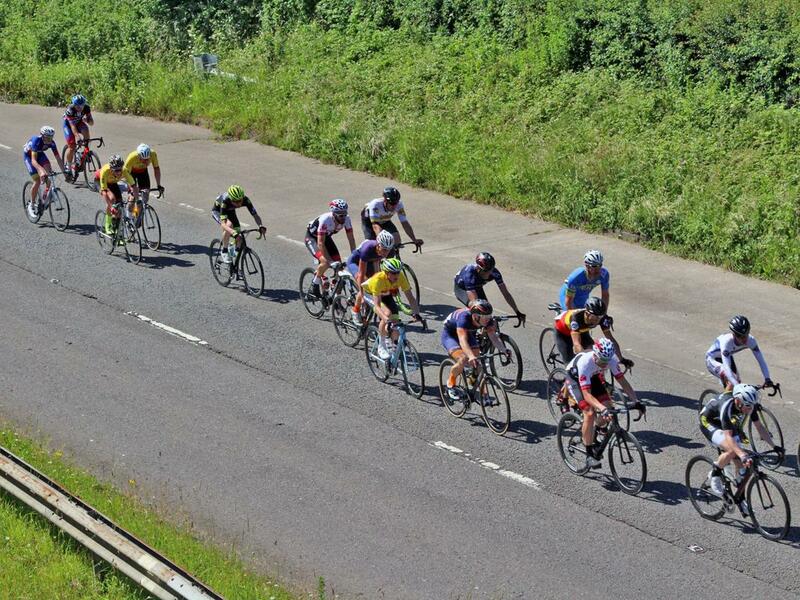 Their gap stuck for about half a lap and then gradually were reeled in by the bunch. As we hit the dual carriageway for the last time, the 5 were still up the road and the bunch not really keen to close the last 50m. I then went to the front and bridged across, catching them just before the roundabout. This had bought a few other riders across the gap and there was a group of about 15 now at the front which included Damien and the main bunch had split. Almost immediately, 5 jumped away and Damien was with them. I tried to sit on and on the long downhill section managed to block enough for them to get a decent gap as they went up one of the drags. 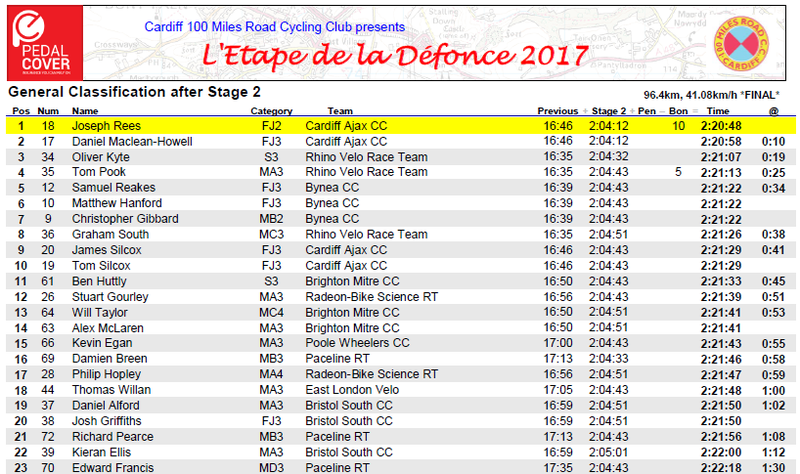 With the finish in sight our 10 were caught by the bunch on the fast downhill section which also included Ed and Colin. I managed to stay in touch and could see that the 5 up the road had a stable gap as most riders in our group were on the limit by that point. The last drag up to the finish line was painful and seemed to go on forever. 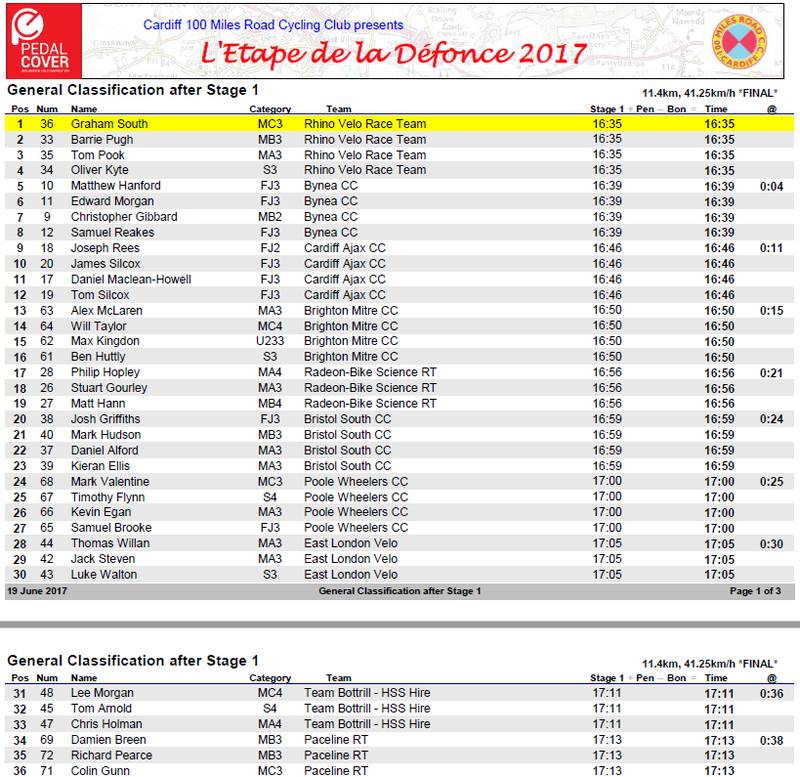 It wasn’t really a sprint at that point but I held on for 18th with Ed close behind followed by Colin in the remnants of the bunch. All in all it was a good stage from the team and a stellar ride from Damien to finish in 5th place. It left us in a good place on the GC with the hilly stage to come tomorrow with Damien 16th, 58 seconds down, me 21st, 1:08 down, Ed 23rd, 1:30 down and Colin 37th, 1:49 down. 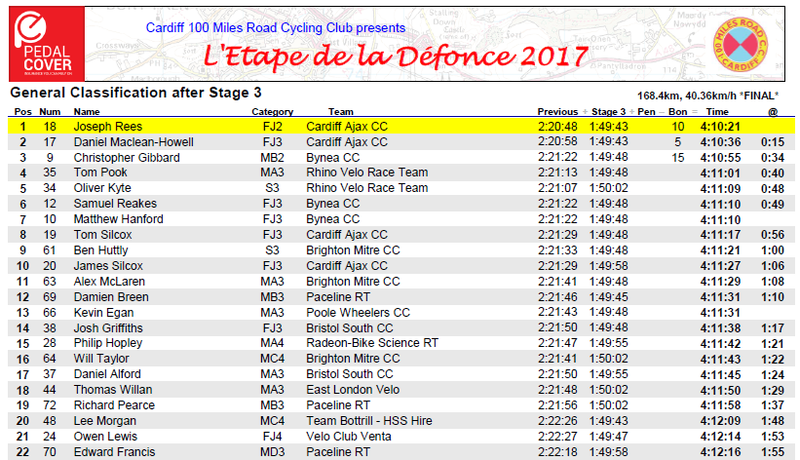 We were now 4th in the team classification, 1:29 down on the leaders, Cardiff Ajax. After stage 2 yesterday, we drove the stage and it was really useful to see and get the teams advice for positioning at key sections, see the climbs/descents and where attacks were likely to go. We rolled out for at the start and it was really hot even at 9:30am. It took a while for the race to get up to speed on the narrow roads as people were fighting for position so I moved up a bit to stay out of trouble. No teams were really driving the pace on the front and a few riders drifted away but were shut down relatively quickly. As we approached Blackmill I moved towards the front ready for the first hill and had a good position and a clear view to hit the climb from the front. 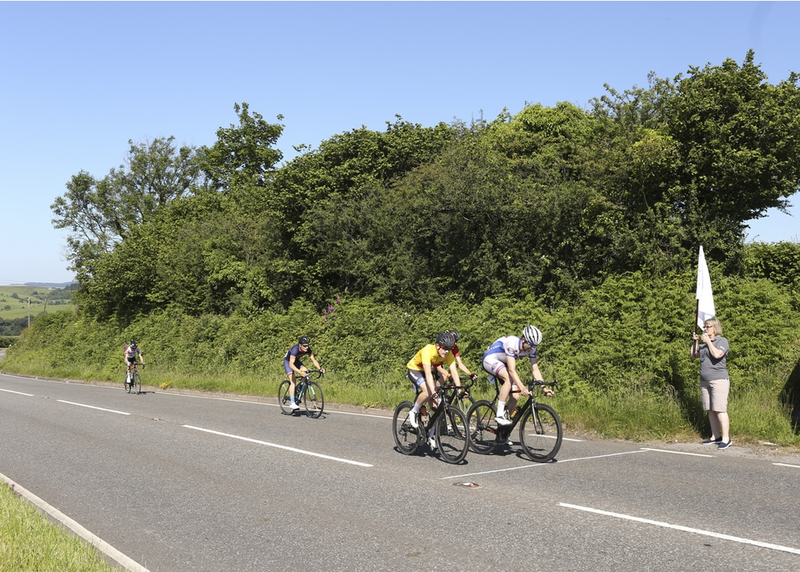 Was passed by some of the welsh juniors which included the yellow jersey and a much thinner bunch behind where Damien was leading the way up the hill towards the time bonuses. 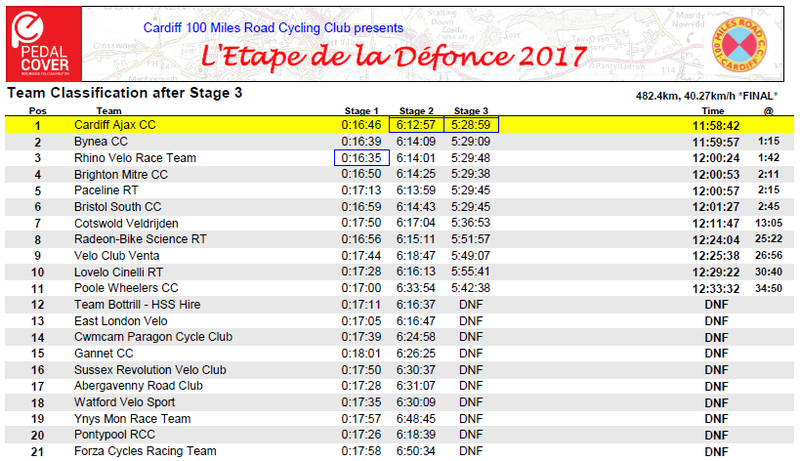 I held on to the top of the climb and settled in and we had Ed in the front group too. 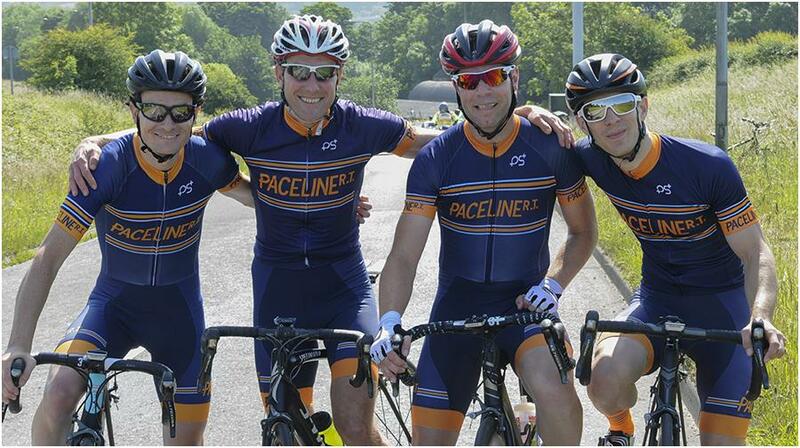 Had expected it to split a bit more but pleased to be in the lead group of about 30 riders. 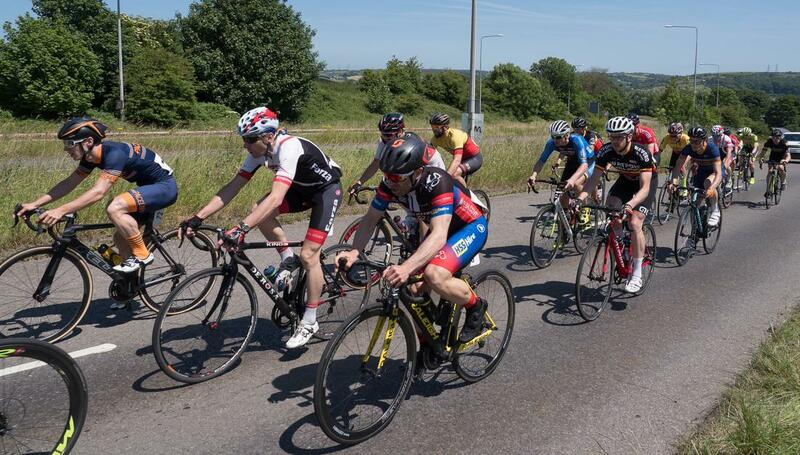 As we were approaching the sprint prime, a Bristol rider attacked off the front and at that point I bridged across the gap knowing that it was just a roundabout then a small rise up to the prime and no one else from the bunch had joined us. I had been in front since the roundabout and had to start sprinting a bit earlier than I wanted to. The Bristol rider came around me and just pipped me on the line by about a wheel. I kept going after the prime as had a decent gap with the bunch out of sight and led the descent then up towards the hill prime. Finally was caught by the bunch about half way up and stuck with them till the crest when I tried to shift up and my chain dropped like Milland Hill. Luckily I stopped pedalling straight away this time and it hadn’t jammed so had to stop at the side of the road to put it back on quickly. Hadn’t lost too much time but I powered over the crest and spent the descent chasing on with a couple of race convoy cars between me and the bunch tantalisingly close. Despite a car turning out a side road in front of me without the traffic being stopped I was catching up along with two other riders that had been dropped on the climb. Finally managed to get past the convoy and back on for some recovery. As we headed back towards Holy Cow the few ramps left were hurting and I started to cramp when out the saddle so had to remain seated and push a smaller gear than I usually would. The efforts of stage, the prime and getting back on were starting to tell and knew I wouldn’t really be able to contest the finish. 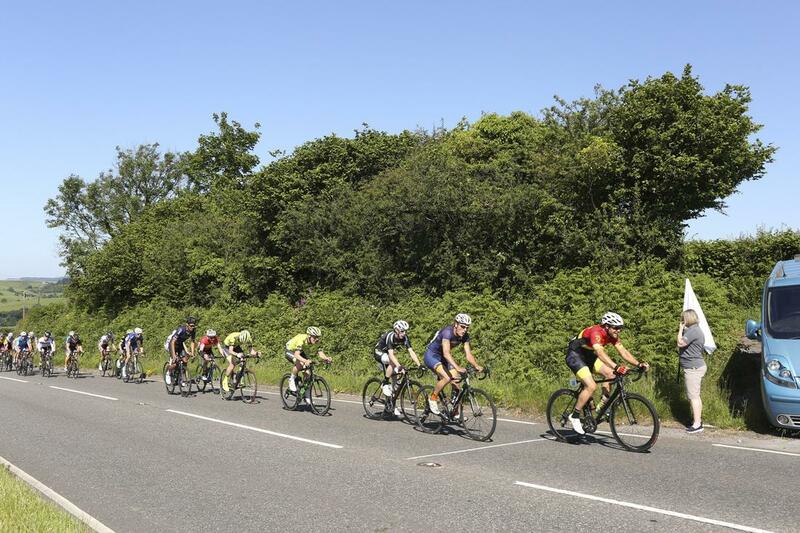 With the yellow jersey and other top GC teams content with time gaps, there was no need for them to work and were waiting for the finish as they hadn’t been gapped on the hills. It was left with Ed and myself doing a lot of pulling on the front without much assistance. Damien was best placed GC wise and was looking strong on the climbs and on the finish of yesterday’s stage so when we turned onto the A48 for the final run in to line the bunch was still about 30 riders strong I went to front and gave it full gas driving the pace as hard as I could. The bunch was getting strung out and as we passed the 1km to go sign a few riders started to attack on the final drag with Damien towards the front again. I was spent and just went as hard as possible to the line finishing in what ended up being 26th place. Overall, it was a pleasure to be in a stage race for the first time in Paceline colours and contribute as much as possible to getting a result for Damien (12th on GC) and PL ending up 5th in the team competition. I was pleased with finishing 19th on GC, 1:37 down having learnt a lot more about racing over the course of the weekend from the team’s collective experience.